This Comvita Manuka Honey is UMF (unique manuka factor) grade manuka honey and is highly regarded. Only some manuka honey has the special UMF activity. This honey is guaranteed to be at least UMF 10+. The Manuka Honey Association (or AMHA), has registered UMF as a trademark so that the antibacterial activity of Manuka honey cannot be misrepresented. The UMF number comes from a laboratory test for antibacterial activity, with the honey being compared with a standard reference antiseptic (phenol) for potency. UMF 10+ would be equivalent in antiseptic potency to a 15% solution of phenol. Manuka Honey which is tested and proven to have the UMF (Unique Manuka Factor) is labelled accordingly. Only honeys with a UMF rating higher than 10 can use the UMF trademark. 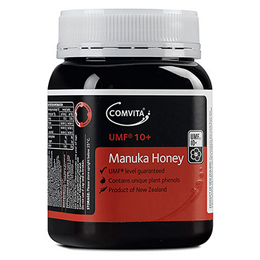 Comvita UMF 10+ Manuka Honey contains UMF antibacterial activity in addition to the hydrogen peroxide found in other honeys. UMF indicates the naturally occurring antibacterial property of UMF Manuka Honey, which helps to maintain healthy digestive function. UMF Manuka Honey has been found to be effective in enhancing the growth of the probiotic bacterial species Bifidobacterium which aid in digestion. 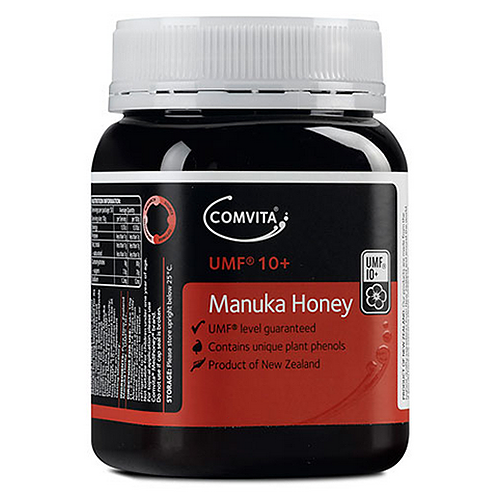 New Zealand UMF 10+ Manuka Honey. Take 1-2 teaspoons (10g) 4 times a day. Not suitable for children under 1 year of age. Below are reviews of Comvita UMF 10+ Manuka Honey - 250g by bodykind customers. If you have tried this product we'd love to hear what you think so please leave a review. Used this product for years, love it! Comvita Manuka Honey is sourced from New Zealand`s remote, pollution free native forests and is world renowned for its unique flavour.